Amberg Entertainment is a full service party equipment and rental company serving the Northwest Arkansas and Missouri areas. Including inflatable rentals, Amberg Entertainment has popular items such as the coconut tree climb, mechanical bull, cliff hanger rock wall, popnoggins green screen, trampoline bounce, black pearl pirate ship, crystal maze, run and splash slide, illumin-art, batter up, and green screen photos – these are hot rental items! . . . Activate this business listing. 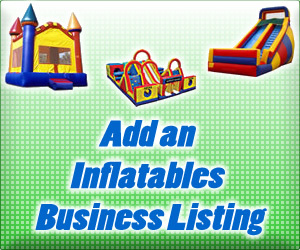 Tags: Amberg Entertainment, AR Bounce House, AR Inflatable Rentals, Arkansas Bounce House, Arkansas Jumping Castle, Arkansas Moonbounce, Arkansas Moonwalk, Bella Vista AR, Bentonville AR, Blackburn AR, Cave Springs AR, Centerton AR, Decatur AR, El Dorado AR, Elkins AR, Farmington AR, Fayetteville AR, Festival Bounce AR, Gentry AR, Goshen AR, Gravette AR, Green Screen Rentals, Greenland AR, Highfill AR, Hiwasse AR, Johnson AR, Lincoln AR, Little Flock AR, Lowell AR, Mayfield AR, Missouri Bounce House, Missouri Inflatable Rentals, Missouri Moonbounce, Missouri Moonwalks, Prairie Grove AR, Rogers AR, Siloam Springs AR, Springdale AR, Springtown AR, Tontitown AR, Tuttle AR, Vaughn AR, West Fork AR, Wheeler AR, Where to rent inflatables in Arkansas? Country Club Entertainment is a premier event rental business serving a number of states regionally with great recreational interactive entertainment. Rentals include inflatables, interactives, rides, climbing walls, lazer tag, motion simulators, virtual reality, table tents and chairs, movie theater, carnival games, and so much more! . . . Activate this business listing. GrandSlam Entertainment is an inflatable rental provider serving Northeast Arkansas and Southeast Missouri. Contact GrandSlam Entertainment for your next birthday party or special event rental needs. Equipment includes great rentals like bounce houses, inflatable slides, obstacle courses, inflatable water slides, and all party needs . . . Activate this business listing.